This traffic conditions map from the Ministy of Transport provides road information on provincially maintained highways in Ontario. Road conditions, construction, closures and restrictions are reported by MTO road patrols, contractors and the Ontario Provincial Police (OPP) to regional communications centres. This information is updated on the map seven times a day. Also traffic cameras located on selected high volume highways, provide images of road and traffic conditions. It is possible to use the map to view the current traffic conditions, closures and restrictions and to view any of the traffic cams. 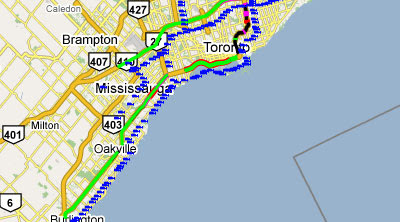 Hwy4cast.com has alos created a Google Maps mashup showing real time traffic conditions for Toronto and GTA. 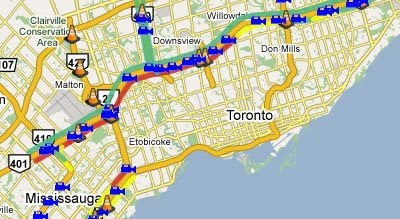 The Toronto traffic conditions are extracted from the MTO COMPASS and RESCU cameras and shown on a Google Map. It is possible to check the traffic conditions for a specific route by entering a start and finish address or by clicking on the map to enter the lat/long automatically. When clicking the map to create start and end points, you can also drag and reposition the markers. It is also possible to click on any of the traffic cameras plotted on the map to view the traffic cam. A satellite image next to the camera's picture shows the direction the camera is pointing.